USGS scientists extracted DNA from aquifer materials and analyzed the DNA for microbial community composition using several methods. Use of monitored natural attenuation as a cleanup option for hazardous waste sites often relies on estimates of the effectiveness of indigenous microbial communities to degrade the contaminant. Typically, samples collected from the contaminated ground water are tested to quantify degradation rates. The degradation rates are used in models to assess the effectiveness of natural attenuation and to design monitoring strategies. 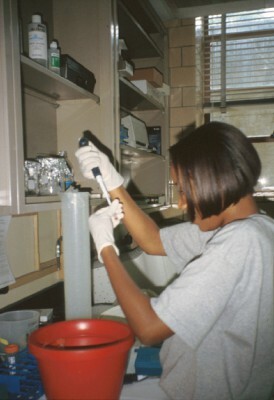 U.S. Geological Survey (USGS) scientists and their colleagues, however, have shown that the composition of the microbial community in a contaminant plume continually changes both temporally and spatially, suggesting that the accuracy of estimates of microbiological degradation depends on when and where test samples are collected. This variability could impact the effectiveness of monitored natural attenuation and engineering systems that enhance biodegradation processes to clean up sites. Failure to account for the variability could result in remediation plans that are less effective because of changes or shifts in the makeup of microbial communities in contaminant plumes. Haack, S.K., Fogarty, L.R., West, T.G., Alm, E.W., McGuire, J.T., Long, D.T., Hyndman, D.W., and Forney, L.J., 2004, Spatial and temporal changes in microbial community structure associated with recharge-influenced chemical gradients in a contaminated aquifer: Environmental Microbiology, v. 6, no. 5, p. 438-448. McGuire, J. T., Long, D, T., Klug, M. J., Haack, S. K., Hyndman, D. W., 2002, Evaluating behavior of oxygen, nitrate and sulfate during recharge and quantifying reduction rates in a contaminated aquifer: Environmental Science and Technology, v. 36, no. 12, p. 2693-2700. McGuire, J.T., Smith, E.W., Long, D.T., Hyndman, D.W., Haack, S.K., Klug, M.J., and Velbel, M.A, 2000, Temporal variations in parameters reflecting terminal-electron-accepting processes in an aquifer contaminated with waste fuel and chlorinated solvents: Chemical Geology, v. 169, p. 471-485. McGuire, J.T., Smith, E.W., Long, D.T., Hyndman, D.W., Haack, S.K., Kolak, J.J., Klug, M.J., Velbel, M.A., and Forney, L.J., 1999, Temporal variations in biogeochemical processes that influence ground water redox zonation, in Morganwalp, D.W., and Buxton, H.T., eds., U.S. Geological Survey Toxic Substances Hydrology Program--Proceedings of the Technical Meeting, Charleston, South Carolina, March 8-12, 1999--Volume 3 of 3--Subsurface Contamination from Point Sources: U.S. Geological Survey Water-Resources Investigations Report 99-4018C, p. 641-651.